The relationship between media representations and real acts of violence is one of the most contentious and hotly debated issues today. This book is the first to bring together a selection of highly influential readings that have helped to shape this area of research. 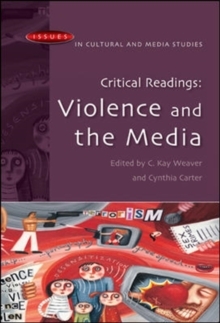 It includes key investigations of how, and with what implications, the media portray violence in the twenty-first century.Critical Readings: Violence and the Media contains sections examining how media violence and its `effects' have been theorized; how media production contexts influence the reporting and representation of violence; and how audiences engage with depictions of violence. Violence is analysed in as it is portrayed in different media formats, including television, film, radio, the news, public information campaigns, comics, video games, popular music, photography, and the internet. The readings cover a range of perspectives, including social learning, desensitisation and cultivation theories, `no-effects' models, sociological, feminist and postmodern arguments. An editor's introduction and section introductions serve to contextualise the readings.Providing a detailed and theoretically grounded consideration of the cultural and social significance of media violence, Critical Readings: Violence and the Media is an essential resource for students of media studies, cultural studies, sociology and communication studies. Essays by: Alison Adam, Albert Bandura, Martin Barker, Eileen Berrington, Douglas R.
Bruce, David Buckingham, David Campbell, Jay Dixit, Lisa Duke, Molly Eckman, David Gauntlett, George Gerbner, Henry Giroux, Jack Glaser, Donald P.
Green, Kellie Hay, Annette Hill, Birgitta Hoeijer, Derek Iwamoto, Ann Jemphrey, Christine L.
Kellow, Jenny Kitzinger, Magdala Peixoto Labre, Catherine Amoroso Leslie, Debra Merskin, Jennifer Paff Ogle, Mary Beth Oliver, Valerie Palmer-Mehta, Julian Petley, Charles Piot, Srividya Ramasubramanian, Dorrie Ross, Sheila A.
Ross, Mehdi Semati, H. Leslie Steeves.